Update 2014: The Maui Makers are back in their original space! Yay! Update 6/10/13: The Maui Makers are looking for a new space! They have been booted out of their Pu'unene classroom and container, to make room for some special ed organization. They are looking for a new space. Please contact them if you know of ideas. To the left is the Maker Matson container, and to the right is the building where meetings are currently held. One really positive thing about HC & S is they do allow nonprofits to have free space and utilities here. The Maui Makers studio doesn't look like much from outside, but this is where you'll find geniuses, or geniuses-in-training. If brain power were gunpowder and you lit a match, this room would ignite. Now there are other places that you'll find really smart people on Maui - like the Institute for Astronomy or a Maui Smug meeting, but this is a friendly place for mini smart people too. Maui Makers come in all ages and sizes, from 6 foot tall adults and retired seniors to wee munchkins and pint-sized kids aka "mini Makers" running around with laptops and ipads. Makers tend to be more male than female, and come to think of it, I haven't seen any teenage Makers, but I'm not a regular attendee. So there could be teen Makers tinkering behind the scenes. business card, posted with his permission. recycled cereal box. Now that's sustainable! The founder of Maui Makers, aka "Benevolent Dictator" Jerry Isdale, is kind of like a lanky version of Santa Claus, without the beard. He likes helping people with their various creative projects whether it's providing illuminated lighting wires for Halloween costumes or laser cutting logos for Source Maui. Correction: Maui Makers did not give away an ipad to one the mini Makers, which I wrote earlier. But they did help a mini Maker enter a working model submarine and win an ipad in a science competition. I met Jerry through Crystal Jean Baranyk, who is a gifted and creative artist. But what is a Maker? To me, a maker is a person who makes things, and who likes to make things, to tinker, to figure out how things work and to take them apart, and maybe put them back together - maybe in the right order, but maybe not. Makers are DIYers - do-it-yourselfers, or better yet, DIWOers - do-it-with-others, and frequently techie or geeky. Makers are part of a larger movement throughout the country and the world, of people who question the notion of always buying things off the store shelf or from a catalog that are produced for the masses and like to custom make things for themselves or others, or to retrofit things and use things in ways they were not originally intended to be used. Things can be surfboards, laser cut t-shirts, plaques, 3-d sculptures, plastic figurines,robots, illuminated Halloween outfits. Makers can be high-tech using 3-d printers to replicate tools or machine parts precisely in plastic, or low-tech using needle and thread or paper and scissors. Since Makers often recycle and use scrap materials, they are also exceedingly sustainable. One of the Maker bibles is "Make" Magazine. Instructables is another site that Makers often visit. Makers embody an attitude of general optimism, can-do spirit, and self-sufficiency. Some historical makers would include inventors, scientists, cooks, architects, artists, welders, homesteaders, and even Santa's elves. Here's more info on Maker philosophy. Usually Makers meet in a a Maker space or Maker studio - a shared workshop area where members can go make things, share ideas, tinker, putz, and creatively brainstorm. There are maker spaces all around the US, and now there's one here on Maui! A Maker Faire is where many Makers get together and share their knowledge in workshops and classes, and these are also held in the US and in other countries. Where the original Maui Makers meetings were held. The Maui Makers hold public meetings on Thursday nights from 6 - 9pm in Pu'unene, past the sugar mill towards the original Maui Friends of the Library bookstore. Non- makers and inquiring minds are welcome to stop by and check it out. A longtime Maker member has said that the organization made a big jump when they were given space inside a building, not just in a Matson container. Meetings are not organized with an agenda and are very casual. Members and the public come in and out sometime within 6-9 pm unless there is a big cleaning project that requires all hands on deck. Resin around a string ball. The energy level is pretty high, as projects are being discussed and mulled over and ideas are being hatched. One recent Maker project was a lilikoi powered laser, which Jerry has blogged about. We did bring some lilikoi to one meeting and Cole powered it up. The laser didn't work that time, but the attempts were quite entertaining and give some idea of the ambience of the meetings. The laser does work though, as shown in Jerry's video of the laser firing. How to get to a Maui Maker meeting? It's a bit tricky, but if you have GPS, you can follow the coordinates on Jerry's business card. Or you can visit my directions to get to Community Work Day's free paint place, since the Maker space is next door. 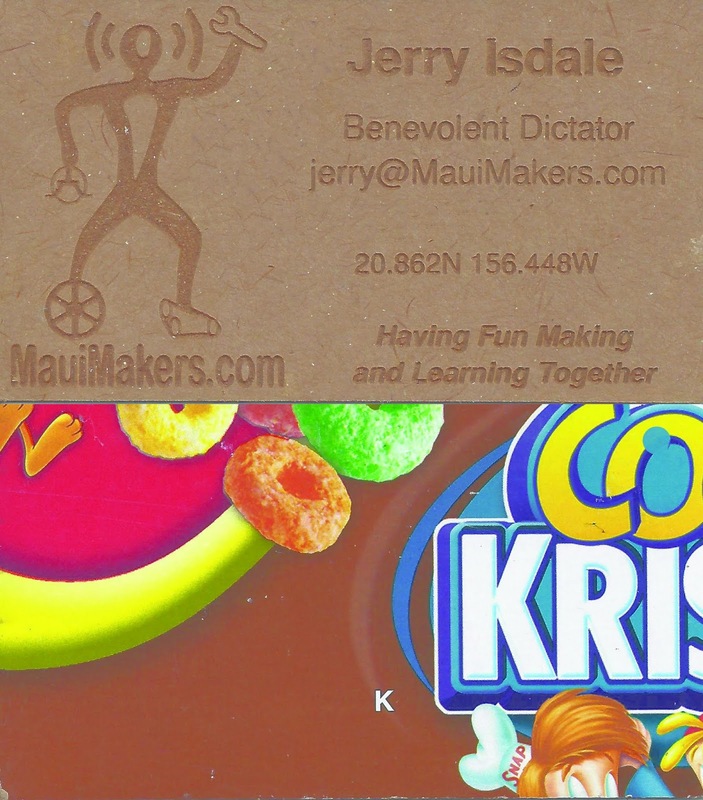 Or you can visit Jerry's directions on the Maui Maker's site. Also, you can come back on Tuesday through Saturday during business hours to browse through inexpensive, used books at Maui Friends of the Library's bookstore. Public meetings are free, but you could also become a member and have access to even cooler gadgets, tools, and toys. So there you go! You never know who you'll meet at a Thursday night Makers meeting. A 6 year old, an organizer for the Maui Children's Museum, a gluten free chef, a retired mechanic, or a rocket engineer. Even Tommy Russo of Maui Time has been spotted at these meetings. It's free and you might come away with a good idea or two, or find a good place to donate your strange cords, sockets, tools, and thingamajigs.